Could your career benefit from an audit? These writing tips can help make sure your accountant resume adds up to success. Can you count on your resume to add up to greatness? To be a successful candidate for accounting jobs, resume expert Kim Isaacs says it helps to have a comprehensive resume. 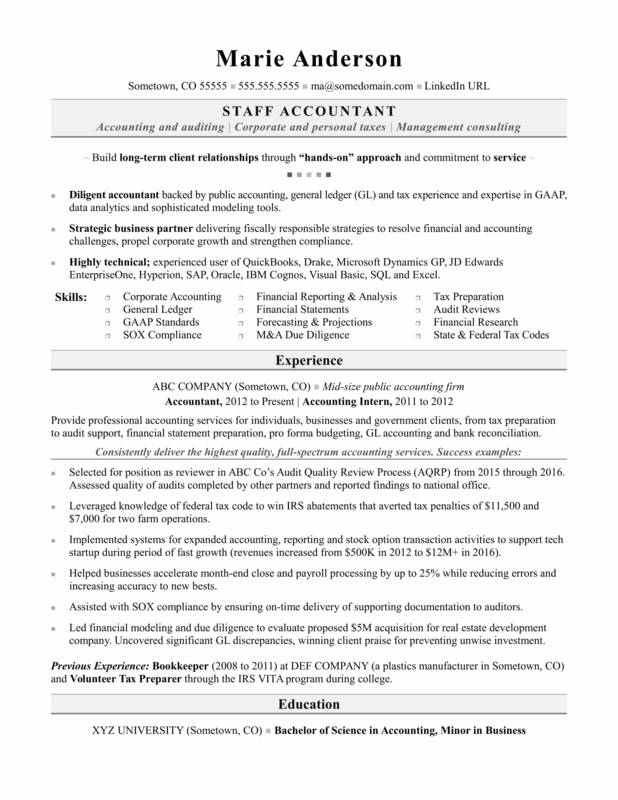 For writing tips, view this sample resume for an accountant that Isaacs created below, or download the accountant resume template in Word. Jobs for accountants are projected to grow by 10% (or 139,900 jobs) from 2016 through 2026, which is faster than average, according to the Bureau of Labor Statistics (BLS). You'll find the highest level of employment for this job in the following states: California, Texas, New York, Florida, and Pennsylvania; and in the following metropolitan areas: New York City, Los Angeles, Chicago, Houston, and Dallas. As an accountant, you can expect to earn a median wage of $69,350 per year, or $33.34 per hour, according to the BLS. Additionally, you can learn more about accounting careers or search for accounting jobs on Monster. Diligent accountant backed by public accounting, general ledger (GL) and tax experience and expertise in GAAP, data analytics and sophisticated modeling tools. Strategic business partner delivering fiscally responsible strategies to resolve financial and accounting challenges, propel corporate growth and strengthen compliance. Highly technicalexperienced user of QuickBooks, Drake, Microsoft Dynamics GP, JD Edwards EnterpriseOne, Hyperion, SAP, Oracle, IBM Cognos, Visual Basic, SQL and Excel. Provide professional accounting services for individuals, businesses and government clients, from tax preparation to audit support, financial statement preparation, pro forma budgeting, GL accounting and bank reconciliation. Selected for position as reviewer in ABC Co’s Audit Quality Review Process (AQRP) from 2015 through 2016. Assessed quality of audits completed by other partners and reported findings to national office. Leveraged knowledge of federal tax code to win IRS abatements that averted tax penalties of $11,500 and $7,000 for two farm operations. Implemented systems for expanded accounting, reporting and stock option transaction activities to support tech startup during period of fast growth (revenues increased from $500K in 2012 to $12M+ in 2016). Helped businesses accelerate month-end close and payroll processing by up to 25% while reducing errors and increasing accuracy to new bests. Assisted with SOX compliance by ensuring on-time delivery of supporting documentation to auditors. Led financial modeling and due diligence to evaluate proposed $5M acquisition for real estate development company. Uncovered significant GL discrepancies, winning client praise for preventing unwise investment. Previous Experience: Bookkeeper (2008 to 2011) at DEF COMPANY (a plastics manufacturer in Sometown, CO) and Volunteer Tax Preparer through the IRS VITA program during college. As an accountant, you know how important it is to be meticulous with the details. The same is true for resume writing—it could mean the difference between getting called for an interview or being passed over. Could you use some help? Get a free resume evaluation today from the experts at Monster's Resume Writing Service. You'll get detailed feedback in two business days, including a review of your resume's appearance and content, and a prediction of a recruiter's first impression. It's a quick and easy way Monster's experts can help you on your way to getting a great new job.